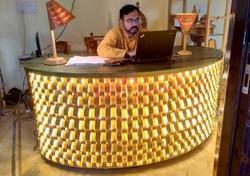 Leading Manufacturer of pine wood double bed with light, pinewood double bed, pine wood dressing table, pine wood reception desk and pinewood stool with lamp from Noida. 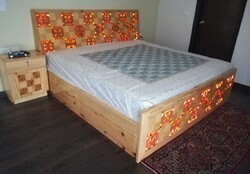 This first of its kind 6x6 feet robust pine wood double bed is unique as it is not only made from the finest quality of imported pine wood available in India but has also built in LED in the headboard and footboard transmitting light from the mosaic patterns made from the growth rings of the pine tree. This elegant double bed is made of best quality imported pine with excellent finish. Simple and elegant looking dressing table with drawer in front and shelves behind mirror. This unique elegant ovalish reception table with excellent polyester polish using Sirca green stainer, is a masterpiece. The beauty of the front wavy pinewood design with LED inside is beyond imagination. This Pinewood Stool With Lampl could be used as a bed side table light or a coffee table. 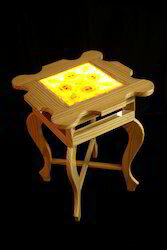 This stool is made out of pinewood with a mosaic pattern in the center. When energized, the central part of the stool glows.Valued as a reliable manufacturer and supplier, we render the premium quality of products. We offer lamps with resistance against termite, elegant design and eye-catching appearance. Strong logistic support has helped us in delivering the rendered wooden floor lamp within promised time frame.